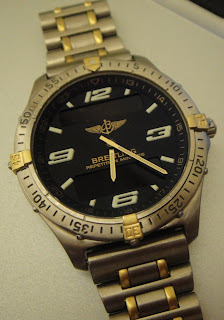 Well, I finally got my Breitling Aerospace back from Breitling Service. Am I happy? Yes and no. I am happy because they solved my module problem. Yes, there was a problem with the module. There was no sound when I used the alarm or the stopwatch or the minute repeater. I had a chat with the seller, and he reimburse me the repair cost. Indeed, the seller is a true gentleman. No because I asked them to refinish the case and general service and I guess they do not do it. Sigh. At least they could refinish the buckle. Anyway, I guess I can live with the wabi-sabi of the watch. Back to the module replacement. The watch is fitted with the COSC certified movement B65 (ETA 988) which has the minute repeater function. The model number for my watch is F65362 as it is the two-tone titanium gold version. The replacement module is thicker as compared to the old original module. 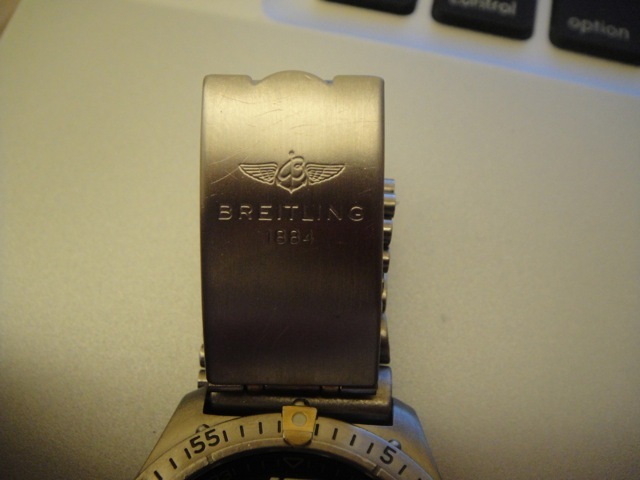 As such they, Breitling Service had to change the case back. Anyway the replacement module comes with the case back as a set. The original case back. If you look at it, you will notice that it does not have a profile at the sides, it is a dome, very little edge thickness. Also the model number is not cased in a rectangle. See the next photograph for a newer case back. The newer case back but still original and not replacement. Perhaps these models are fitted with the newer module? Note the model number inside the rectangle. The new case back on my watch. 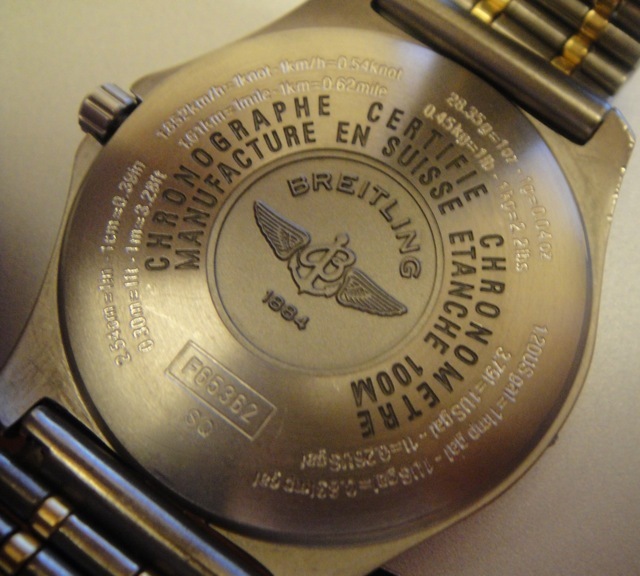 It is the same as the one above but with the addition of the legend 'SQ' below the model number, which is inside a rectangle. It also has a slightly thicker edge. The best part is that Breitling etched the same serial number on the new case back. 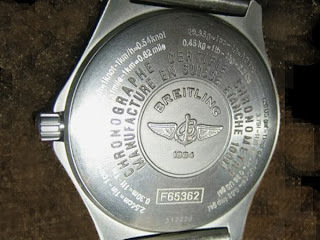 They also replaced all the gaskets on the watch, both on the case back and on the crown. 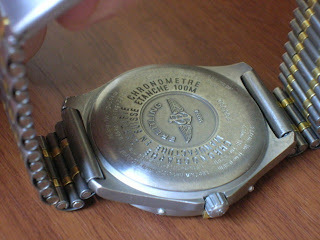 They also tested the watch for its rated water resistance which is 10 ATM. Best of all, I got a years warranty and a service box. Total cost? About USD 600. So why one in and one out? Well the Bell and Ross BR01-92 is out for a service. I sent it to the AD for it to be sent for the service. Hope to get it back in about a months time. Anyway, I decided that my daily use watch will change from the Aerospace and BR01 to another set of three watches, the Benrus Type 1 reissue, the Marathon SAR 2005 contract and another watch I did not expect to get but did. More on that in another post.